Looking for tires near you in Northglenn? Firestone Complete Auto Care can get you back on the road with the best tire brands. Visit our shop to find your tires today! 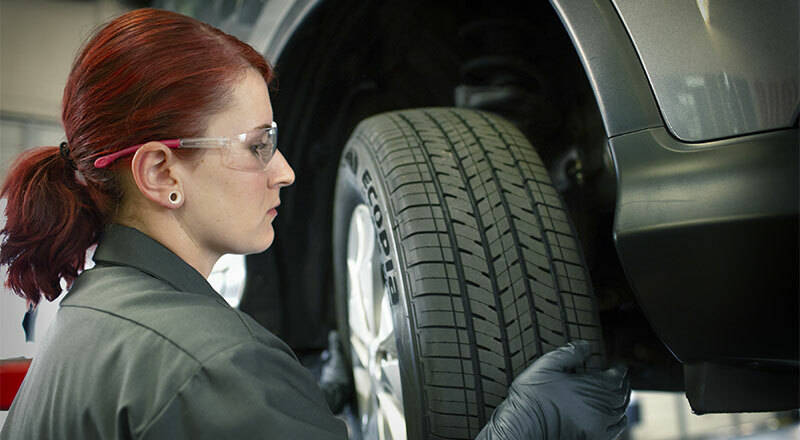 When you need new tires in Northglenn, you need Firestone Complete Auto Care. Whether your trusty ride is a truck, car, crossover, or minivan, we'll hook you up with tires for less. We'll help you choose the best set of tires for your climate, driving style, and vehicle. Shop the entire tire catalog online and learn about some of the most-loved brands in the business, Firestone and Bridgestone. Then schedule your installation at a time that's convenient for you! From studded winter tires to slick sport tires, Firestone Complete Auto Care has what your vehicle needs. Unsure if it's time to change your tires? Our technicians are here to help, but you can do a little investigating at home, too. Start by checking your tread wear. If the tread is shallow and worn, your tires might struggle to grip the road safely. That's a safety issue! Also, pay attention to any bumps, bulges, tears, or sidewall cracks, and note your tire age. Your tread may look A-OK, but car manufacturers usually recommend getting new tires every six to ten years. It can be a safety concern, something that's very important to us at Firestone Complete Auto Care in Northglenn. Chart a course towards adventure or a smoother commute with the right tires from your nearby tire place, Firestone Complete Auto Care. You'll get exactly what you need from the most trusted brands in the business, including Bridgestone, Firestone, and Primewell. Trust us with your wheels and you'll get much more than professional installation and advice. We'll also provide you with free tread and pressure checks, along with quality flat tire repair, rotation, and alignment. We've been a top tire shop in Northglenn for many years, and one of America's leading tire providers for close to a century. For quality service at spectacular prices, come to Firestone Complete Auto Care. Shop new tires online and book your installation appointment today! From state inspections to batteries to engine repair, rely on your nearby Firestone Complete Auto Care for your automotive service needs. We're an automotive shop, tire store, and car care center wrapped into one. Our highly qualified technicians care about keeping your car running newer, longer. Regardless of the maintenance your car or truck needs, we’ll strive to provide unparalleled auto services. Explore our services and at your convenience, schedule your next courtesy check or repair in Northglenn, Colorado today.